Try searching the Americas to find creators of folk art with more form, symbolism and importance to the development and sustenance of their culture, than those of indigenous ancestry in Oaxaca (wa–HAW–ka), one of the southernmost Mexican states. Many so-called experts in folk art have mistakenly written that the origins of Oaxaca’s wood carving tradition date back fifty or sixty years, to a small number of carvers residing in one of the central valleys of Oaxaca, a few miles from the state capital of the same name. The error has consistently been equating the recent commercialization of the art-form with its origins, and ignoring its pre-Hispanic roots and subsequent development. Jacobo Ángeles lives with his wife María and two children in San Martín Tilcajete, one of three main native Zapotec villages, where most residents earn a living from carving and painting colorful figures, often generically referred to as alebrijes. The others are Arrazola and La Unión Tejalapan. San Martín Tilcajete is located about a 40 minute drive from the city of Oaxaca, along a highway leading to the state’s Pacific resort towns, including one of the oldest ports, Puerto Escondido. Puerto Escondido was a hub for the export of coffee and other cash crops during colonial times, but is now a popular beach destination for Mexican and international vacationers alike. Many travelers combine their sun and sand vacation with a visit to Oaxaca, a UNESCO World Heritage Site, searching out unique pieces of folk art including dance masks, pottery and clay figures, rugs and tapestries, and antiques from the colonial period forward. And of course there are the pre-Hispanic ruins, galleries, impressive Dominican churches, museums, and renowned Oaxacan cuisine. Indeed the world has taken notice. Jacobo’s work is prominently displayed in The Smithsonian Institute, Chicago’s National Museum of Mexican Art, and elsewhere throughout the continent and further abroad, in museums, art colleges and galleries. Jacobo regularly traverses the U.S. promoting Oaxacan folk art and his Zapotec heritage, teaching in a diversity of educational venues ranging from junior schools to university departments of fine art, and as honored speaker at art exhibition openings. A visit to the Ángeles workshop, accessed by a heavily pot-holed narrow dirt road towards one end of the village, affords an opportunity to learn about this extraordinary skill-set, from Jacobo, Maria --- an excellent painter in her own right --- and some two dozen other members of their family who produce some of the finest quality carvings found anywhere on the continent. The men do most of the carving, while women do most of the painting, but the tasks are definitely not exclusively based on gender lines. Carving is done with non – mechanical hand-tools such as machetes, chisels and knives. The only time a more sophisticated tool is used is when a chain saw is employed to cut off a branch and level a base for a proposed figure. Except when a special order is received, the woodworkers in the family are given artistic license to carve whatever figure they wish. A piece of tree trunk will “speak” to one of these specialists, and be the inspiration for creating a particular animal: the shape, thickness, and bends and twists in the piece come alive. After the bark is removed, a detailed outline is drawn, defining the image with greater clarity and detail. The sculpting in earnest then begins. The carving alone takes up to a month, at times longer. The figure is then left to dry for up to 10 months, depending on its overall size and thickness. Because of the properties of copal, and Oaxaca’s semi-tropical climate, the wood is susceptible to termite infestation. Accordingly, during the drying process the piece is soaked in a gasoline / insecticide mixture for several hours. As an added assurance, it’s then placed in an oven, just in case eggs have evaded extermination. “All of our pieces are guaranteed to never have a termite problem,” Jacobo assures. One cannot help but gasp at the sculpting genius which goes into each piece: A starving dog scratching fleas, a bear with its paw in a honey pot, a snake constricting a wincing jaguar, a winged horse on its hinds, a woman with long braided locks and the body of an armadillo, or a deer, life-size by Mexican standards. There’s something particularly arresting about each creation: the ever-so-flowing and realistic movement, a fanciful stance, or a familiar pose striking a chord with our popular characterization. However the painting is anything but familiar. No color goes untested and the intricacy of and variation in design is remarkable. Using his hands as palettes, Jacobo begins by placing a small amount of the powdered bark in one hand, squeezes juice from a lime, creating a brown, which he then places on an unpainted wooden owl. “Yes the owl is also one of our sacred creatures, the great healer, quiet and humble.” He reveals: “Now over time, and in the sun, this color will change or fade and be absorbed into the wood. So what our ancestors learned to do was take the dried sap from the copal tree and heat it up with honey. The resulting liquid is then mixed with the paint, changing the color a little; see, it becomes a deep orange … but most importantly it acts as a mordent making the color permanent, and a little shiny.” He adds powdered limestone, and the color changes to black.  With the addition of baking soda and more lime juice it becomes a deep yellow, and with more chemical it miraculously becomes magenta. A new base is then started, with crushed pomegranate seeds. Magically the pulverized pink is transformed into green with the addition of limestone powder. Mixed with the magenta, it becomes navy blue. With the addition of zinc it becomes grey, and with more zinc, white. Blue from the añil tree, indigo, is altered with the addition of bicarbonate, zinc, lime juice or the powdered lime mineral. Corn mold, a black gooey culinary delicacy known as huitlacoche, when fermented and then powdered, yields ochre. The red of the dried and then crushed minute insect, the cochineal, which feeds off its host nopal cactus, becomes orange with the addition of the juice of any of a number of acidic fruits. The demonstration terminates with Jacobo asking, “what´s your favorite animal,” following which he finger paints a rabbit from the rainbow of colors on his palms, as only Alice could have imagined. With approximately 150 families now producing painted wooden figures in these and a couple of other smaller villages, the questions left unanswered remain: What facilitated and drove more carvers to adopt the papier maché style of using brilliant color combinations, and how can everyone in these villages make a living from this solitary art-form? As with other crafts in the central valleys of Oaxaca, their production wasn’t always the primary means of sustenance for the populace. Traditionally, handicrafts were a hobby or part-time trade, beginning with very few items being sold to the odd passerby, adventurer or traveler. In the case of rugs from nearby Teotitlán del Valle, there were trade routes that producers followed in order to effect more sales in other regions of the state, and in some cases beyond. But the primary means of family survival was working the land and small-scale ranching. And in the case of the carving villages, there never was a broader market, although in San Martín Tilcajete embroidered shirts, blouses and dresses were an extremely well-received craft throughout the 1960’s and into the 80’s. Dramatic change in production and marketing of wooden carvings had its genesis in the 1940’s. The pan-American highway cut through the Sierra Madre del Sur mountains, reaching Oaxaca, opening up the region to the north, in particular Mexico City and the border states. Until then Oaxaca was relatively isolated notwithstanding a rail connection. By the 1950’s and early 60’s Americans and Canadians were prospering from the post-war boom, credit cards had been mailed to virtually everyone, and word spread of a new kind of vacation, in a third world country, Mexico. Jet air travel facilitated the transformation. The women’s movement meant more two income families, resulting in more disposable income for traveling. Mexicana Airlines and Oaxacan travel agents partnered to begin offering tour packages, which further facilitated tourism to the region. The hippie movement of the 1960’s and early 70’s brought Oaxaca to the forefront of the alternative lifestyle, with throngs of youth and their pop idols traveling to Huautla de Jiménez, then a tiny Oaxacan village, to eat hallucinogenic mushrooms with the now infamous healer María Sabina. North American youth saw and purchased the first generation of contemporary wood carvings. 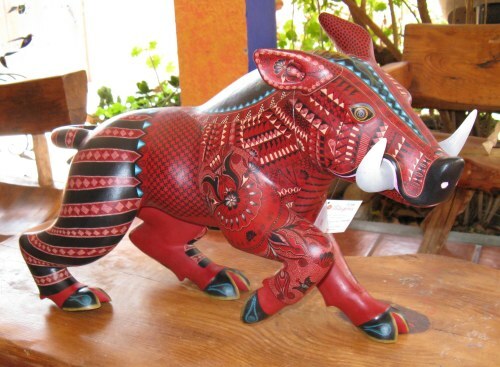 By the 1980’s, as a consequence of multiple factors, Oaxacan alebrijes had become well-established as folk art, with the market continuing to grow. The economic implication was that farmers and ranchers were able to spend more time carving and painting, and less time in the countryside and in marketplaces vending their produce and animals. With a new toll-road opening from Mexico City to Oaxaca in 1995, access to the southern state became even quicker and easier, and safe. In good conscience, travel writers were no longer able to warn tourists about driving the switchbacks, back-road banditos, or cars overheating on secondary roads without service stations. The future market for the artistry? While the odd visitor to a Oaxacan coastal resort such as Puerto Escondido, or the more popular Huatulco, does visit the state capital and the workshops of carvers like Jacobo, most do not. Within the next four years a new highway to the coast will open, cutting road travel time by at least a third. Even more sun worshipers will visit Oaxaca, and marvel at the art of Jacobo and María Ángeles. Since opening their family workshop in 1996, without a doubt Jacobo and María have singularly raised the quality bar for other villagers who aspire to mirror their success. With Oaxacan wood carvings of superior quality now well established on the world stage, and access no longer an impediment, the challenge for others in San Martín Tilcajete will be to achieve the success of the Ángeles family through production of like quality, until now eluding most. For high end collectors, we can only encourage the success of all efforts aimed at maintaining the growth and development of the Oaxacan woodcarving tradition, since it satisfies and advances our penchant for and obsession with quality hand-fashioned craftsmanship. For the artisans in the region, aside from the obvious economic importance, it’s part of maintaining their Zapotec heritage and illustrating the richness of the culture to the broader world. The workshop of Jacobo and María Ángeles is located at Calle Olvido #9, San Martín Tilcajete, Ocotlán, Oaxaca. Telephone: (951) 524-9047; Web: www.tilcajete.org; Email: angeles@tilcajete.org. Alvin Starkman together with wife Arlene operates Casa Machaya Oaxaca Bed & Breakfast. Alvin received his masters in social anthropology in 1978, and his law degree in 1984. Thereafter he was a litigator in Toronto until taking early retirement. He and his family were frequent visitors to Oaxaca between 1991 and when they became permanent residents in 2004. Alvin reviews restaurants, writes about life and cultural traditions in Oaxaca, tours couples and families to the craft villages, market towns, ruins and other sights in the state's central valleys, and is special Oaxaca consultant to documentary film production companies. This page has been visited times since September 2, 2008.